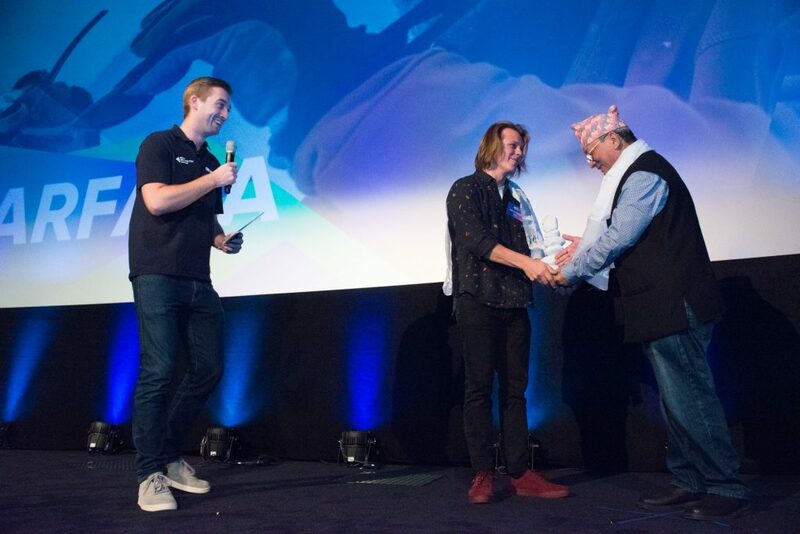 This year the jury was looking for an auteur film where the director’s vision, in terms of subject matter or execution, is conveyed by both the narrative and the imagery. The winner of this year’s award is undeniably a film which excels in this. The director has chosen a form which is identifiable for the community in which the film is set. Form and content complement each other. In the current digital age, characterised by selfies, voyeurism and social media, the narcissism of the leading protagonist is persuasively portrayed through the medium of GoPros. Viewers are almost literally cheek by jowl with the main characters, with their unfolding story and jaw-dropping feats sweeping the audience away. The film singles itself out from other mountaineering films in this genre because the stunts we see are not actually stunts at all, but real-life jumps carried out by real-life base jumpers. Much more so than in other mountaineering films, the viewer is able to understand exactly why the protagonist is mesmerised by the thrill of the sport, a question that is posed subliminally as leitmotif as the drama unravels. Slowly but surely, the rationale and the motivation of the main character, a person who films his life constantly, unfold through the brilliant interweaving of film scenes on the protagonist’s editing table, where film fragments are spliced to bring about revealing insights into himself and the people around him. The real tragedy is that with the death of base jumper and actor Alexander Polli, fiction is overtaken by reality. The effect is to give the viewer a surreal experience. In a wider perspective, the film raises the question as to whether the posting of film and photo material on social media is responsible for spurring on viewers to perform even more death-defying stunts or challenges, culminating in yet more incidents and fatal accidents. The jury sees this film as a powerful wake-up call for filmmakers in this genre. The film is not a detached description of a performance jazzed up with clichés, but one that keeps the viewer on the edge of their seat from start to finish, confronting them with their own longings and shortcomings. 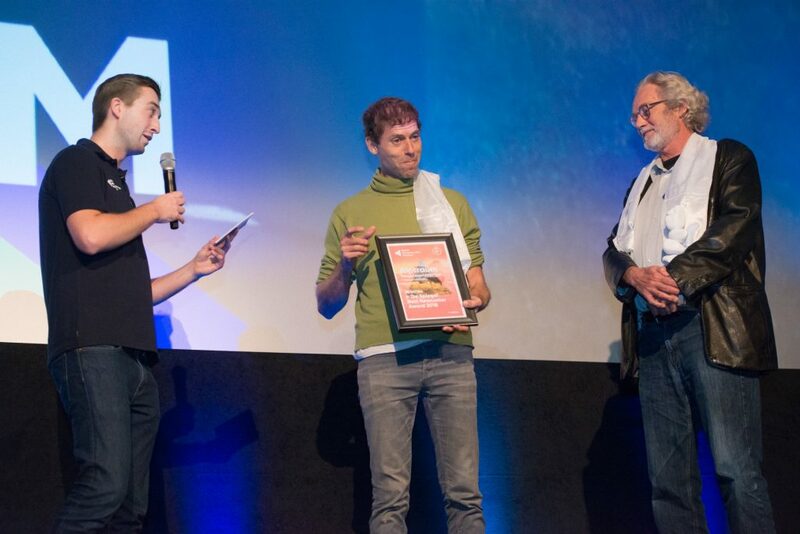 As such, Base is the worthy and inspiring winner of the film award for the eighth Dutch Mountain Film Festival. The jury prize this year goes to a film that shows that short stories too, are perfectly suitable for exploring universal themes and questions. Does the main character of the film have a destination or is he simply trying to escape from something else? It’s a question posed by the vision of a ghostly figure which begrudgingly trudges its way through a snowstorm and one that will not let you go for the rest of the film. The rhythm of the montage, which is as comforting as the surroundings and the purity of the camera work, leads to the realisation that the protagonist is better off here than he is at home. The director succeeds in capturing the silence on film. If anything can be said about the film, it’s that its fails to explore more deeply the emotions that begin to surface. Viewers are left wanting to know the sadness the man is really hiding. But it is the poetic mood of the film which renders the production worthy of an award and a masterpiece within its genre. The best debut film award goes to a director who has balls. Balls, because – in all his naivety – he undertakes an experiment in which he is not afraid to show that mountains not only give, but take away too. And that mountains not only bring out the best in people, but also the most primitive. So it’s not always the easiest film to watch. Not only do we witness a friendship slowly fall apart, but we see the animals tended by the main characters suffering badly too. This gave the jury a major dilemma, because we wanted to judge the film on its artistic merits. But seeing as the director and the main character were one and the same, we found it difficult to see these in isolation from the manner in which he treats his surroundings. Praiseworthy is the fact that the director does not use himself sparingly in the montage. It would have been easy to shift his downfall onto the other characters who ultimately disappear out of view. Or even onto the weather. At the moment when the friendship is put under real strain, it starts to rain and doesn’t let up for the rest of the film. Throughout, the director constantly bears his doubts and fears, but also his hopes. And although it’s not the most pleasant side of yourself to be confronted with, it ensures that viewers can identify with the hero and that – even with a knot in their stomachs – they remain a captive audience throughout. The director might fail to portray all the conflicts demonstrably on film, but at least by baring these to the audience, he succeeds in showing his great potential as a filmmaker. 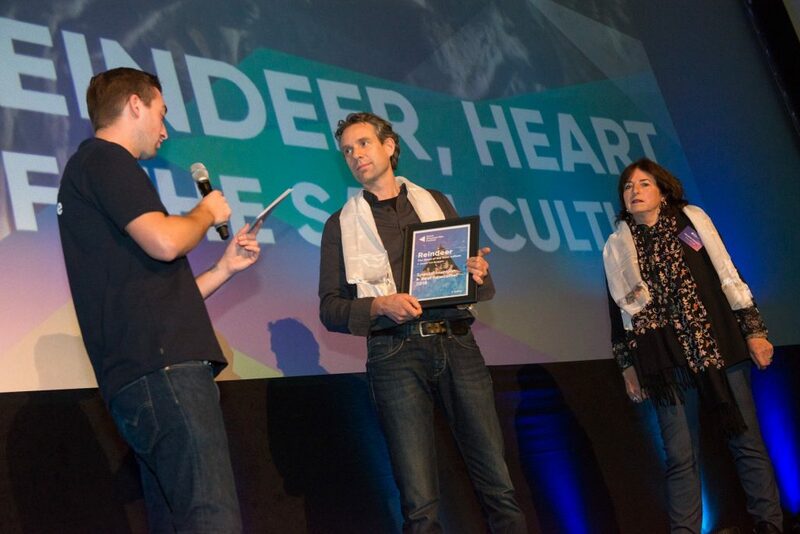 A special commendation is always given for a newcomer to the Mountain Film Festival scene. This film tells the important story of what happens when the so-called overriding interest, i.e. economic growth, is put before the local interests of ordinary shepherd folk. The film poignantly portrays how age-old traditions and customs have been preserved. The natural progression of the seasons is beautifully rendered by the cyclical movements of the animals being rounded up into their corrals. The fact that the film is not an outright winner is perhaps because the director, in his veneration and love of tradition, falls short when it comes to dealing with the counterforces that are present. We believe there is wider scope there for an even more powerful film. Nevertheless, the jury expects much of this promising young director and hopes that this special commendation will offer him the encouragement to continue along this chosen path.